With the YOUTH FACTOR Complete System you'll notice your skin looks and feels soft and supple, giving the illusion of flawless-looking skin. 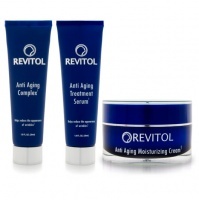 You'll see results right away and over time, with continued use your skin will look more revitalized. The Youth Factor System is a scientifically advanced breakthrough in beauty. It provides a “Sequenced Amino Technology” that delivers two advanced cutting edge activators. One relaxes the facial areas to prevent frowning and deep lines; the other builds collagen under the skin to plump it up. The complete system: 1 Daily Hydration Treatment, 1 Multi Treatment, and 1 Intensive Treatment Jar w/ Pads. Daily Hydration Treatment replenishing cream that restores skin suppleness while it moisturizes, hydrates, softens, and increases circulation. Multi Treatment replenishing cream that restores skin suppleness while it moisturizes, hydrates, softens, and increases circulation. Intensive Treatment Pads Delivers key ingredients to the skin by penetrating deep into the dermal layers. Order Now!